On the bookstore shelf, the main title Knocking on Heaven’s Door is likely to spark images of Bob Dylan (Guns-N-Roses for a younger generation) or, perhaps, to prod the interest of those seeking a connection between divinity and science. The truth is that this book does very little of either, but it does offer much more. The subtitle is much more helpful in describing what this book is really about. Dr. Lisa Randall, a world-renowned theoretical physicist, provides an expansive perspective on the role of physics and science in the universe. Building on her previous book, Warped Passages, Knocking on Heaven’s Door is very accessible, readable, and appealing to a broad audience—peppered as it is with the vernacular of the digital age of Google maps, online comic strips, and anecdotal references to pop culture. This accessibility makes this a timely contribution to younger laypersons interested in why physicists want to speed up and smash protons in some huge tunnel in Europe. Throughout Knocking on Heaven’s Door, there is thoughtful preparation in explaining complex and abstract ideas. The content is likely best enjoyed by someone who has a little background in science, but is certainly not overwhelmingly saturated in geek-speak. Dr. Randall does a nice job of explaining concepts so that the science novice likely will not need to review a chapter or section more than once to grasp the key points. There are about 80 or so diagrams and pictures, mostly helpful and aimed at providing descriptions for some of the more challenging concepts of modern physics. There are just as many chapters, collated into six main parts—but most of the chapters are only about eight pages long, easily digestible. Within each of the chapters are subheadings that often provide logical breakpoints, helpful for those challenged by the trickier scientific concepts. The first part of the book, Scaling Reality, weaves a discussion of today’s pop science and the history of science with well-placed recognition of pioneering scientists such as Hamilton and Galileo. This is followed by a lightning-rod discussion of where science fits in the “real” world, referencing art and religion. Dr. Randall asks the question of who has the capacity, or right, to look for answers in the universe. Dr. Randall is not presuming the pomposity required to provide an answer; rather, she delicately reasons and balances the various perspectives. In the second part, Scaling Matter, Dr. Randall demonstrates her intellectual breadth and thoroughness by exploring the notion of “scale” in biological, physical, and subatomic systems. This section also provides the rationale for the Large Hadron Collider (LHC) experiments in Europe—the world’s largest particle accelerator—designed to answer some of the most perplexing and fundamental questions posed by physicists. This is followed by a discussion of the smallest conceivable scale (Planck length) and, finally, String Theory. The chapters in this part of the book explain numerous complex physics concepts in an unintimidating manner. These chapters are, however, perhaps not as tightly woven together as are others. Most of Part Three, Machinery, Measurements and Probability, is devoted to the LHC— a 27-kilometers-long hollow donut that speeds up protons at the speed of light—and describes its operation, technology, history, and multinational politics. An entire chapter is dedicated to debunking the myth that, when the LHC is turned on, the black holes it would create will collapse our known world. Dr. Randall quickly follows this with a more believable discussion of the very recent collapses in our world’s economy. In Part Four, Modeling, Prediction and Anticipating Results, author Randall reflects on the need or desire for symmetry and beauty in a scientific or physical model, and continues with a well written discussion on what role the Higgs Boson may play in scientific models. The Higgs Boson is a magically weird particle whose mass seems to befuddle physicists, and Randall explains the role the LHC may play in bolstering, or collapsing, the current paradigm of physics. Whereas the first four parts focus primarily on the microscopic, Part Five (Scaling the Universe) explores the macroscopic universe. Dr. Randall does a nice job describing seminal aspects of cosmology while easily connecting it with the LHC experiments. The final part winds down all the science presented in the book and offers a nice discussion on the importance of creativity in all vocations. If one central theme exists in this book, it is the justification, technology, and science of the widely touted LHC experiments. The release date for this book is almost precisely three years from the LHC’s inaugural opening. Dr. Randall provides a convincing celebration of the LHC while also delving into the broad implications the experiments might bear to fruit. 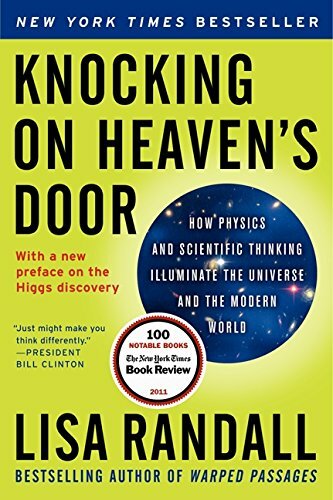 Whether this book lives up to expectations the title might create is debatable; however, a read of Knocking on Heaven’s Door makes one thing certain: Dr. Randall’s passion and excitement for science and physics is infectious and welcome in our digital age. Parminder S. Basran, Ph.D., is a Medical Physicist, Adjunct Associate Professor of Physics and Astronomy in Victoria Canada, and a Fellow of the Canadian College of Physicists in Medicine. His professional interests include applied technologies and the history, philosophy, and instruction of science and mathematics.